Map Description Two temples, and one weak bridge between. Cool design of the temples, sweet q3 style textures and good models. I really can't give this map a high rating. The waterfall/rocky part looks pretty good, but the rest of the map is far too bland in texture usage and lighting. The layout is rather boring. Good idea. Good build. Good models. The layout is boring? May be, but my rating is 10. Decent looking map. Well constructed. Runs well. Bots work well. Because there is only one path between the flagbases it's not very good for CTF gameplay. Nice looking map, especially i like design of the red base. The blue base is also beautiful, but slightly monochromatic. Although the map is playable with bots, it's designed mainly for playing with humans. The layout is simple at first sight, but the upper level (accessible only through shield jump) gives many tactical abilities, both for capturing and for defending. Running through the small narrow bridge is very dangerous. You can also move between the bases using very difficult shield-double-jump from one balcony to another. As a result, you can bring the flag to your base only if you have good team support, or if you can perfectly make special jumps. Beautiful, well designed map with original gameplay. Excellent job. and if the mapper did make those statues in his map..
why does the rest of the map not reflect that. edit: ow and dont have your friends rate the map high.. its ghey and lame. It was alright.. Not a theme Im very fond I'll admit. It was pretty decorated in areas, except for the fact that there wasn't much trails and strategy involved in getting the flag. 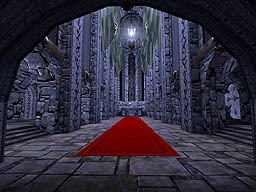 Some areas real dark and were shaders, some were just plain, in general, could of been brighter and more have more rooms. An over-rated map, in my opinion. True, there is some potential here, but potential doesn't cut it. First off, the visuals were rather underwhelming in my opinion. The same few textures, which looked pixelated and unconvincing, are used incessantly, and most of the construction is simple BSP. I'm not sure if the author did make any of the statues, but I recognized two of them as being taken from "Serious Sam." (Author: Did it get it right? :-) ) The lighting was particularly monotonous, and many fixtures such as windows, lamps, and rugs looked overbright. 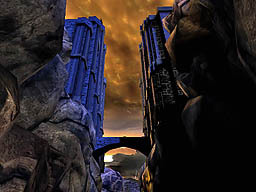 The outside did look nice though, and I thought the Unreal vs. Quake idea was kind of cool. Gameplay was not really there either. The basic setup seems to be a straight line, with excessive teleporter assisted defense. Just didn't do it for me, sorry. I look for more z-axis, connectivity, and variation. It's alright, the map is a long shot above many of the maps that show up these days. The author obviously puts some care into the creation, so I think with some more refinement we will see some truly high-ranking maps soon. 100% agree with Jedibiah but I also hate this theme, its so boring. i admit, this map has its limitations, but it's quite fun. the bases in particular are working well with the columns down one side for the offense, and the ledges (with z-shots) above and around the flag room. i'm sort of reminded of bridge of fate , but half size. the single bridge is challenging, but not impossible. i liked the Q3 vs unreal theme. the only major let down was the textures and lighting. 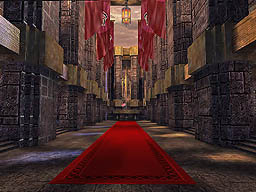 i know some mappers lately have taken some quake textures and updated them to look decent in 2004. whatever textures these are, they are not good to look at, and give some strange visual effects when moving past some of the walls.